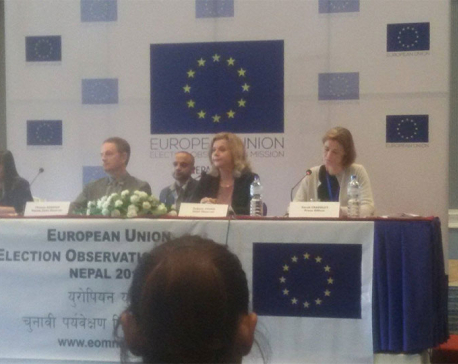 KATHMANDU, Dec 13: Nepal and the European Union (EU) have signed a grant contract of 5.5 million euros (Rs 667.9 million) with the Council for Technical Education and Vocational Training (CTEVT) for implementing the 'Sakchyamta' (i.e. Competency) project. The CTEVT will be contributing 61111 euros as co-financer of the project. According to a press statement issued by the EU Office in Kathmandu, Head of Cooperation at the EU Nepal office Andreas Roettger and CTEVT Member Secretary Pushpa Raman Wagle concluded the agreement at the CTEVT office on December 8. The Sakchyamta project is part of the larger 20 million euro 'EU-Nepal Practical Partnership for Technical Vocational Education and Training reform (TVET-PP)' project where EU has also joined hands with the private sector and the British Council. "As Nepal is now embarking on a new phase of federal governance a strong focus on unleashing the economic potential is crucial for the nation's vision and drive toward LDC graduation by 2022 and middle income status by 2030. We hope the Sakchyamta project will play a pivotal support role in boosting economic growth by helping to create a more demand-driven workforce," the statement quoted Roettger as saying after the signing ceremony.